Many people know that October is the nationally recognized month of Breast Cancer Awareness. Most do not know that it is also the nationally recognized month of Pregnancy and Infant Loss Awareness as proclaimed by President Ronald Reagan in 1988. 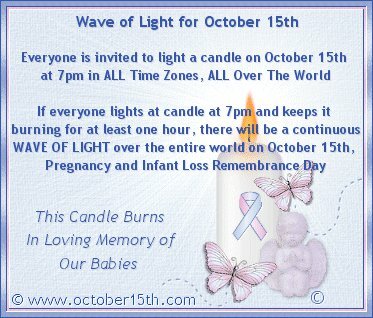 October 15th was then envisioned as a day for families and friends to come together to remember and honor babies who left this world too soon. 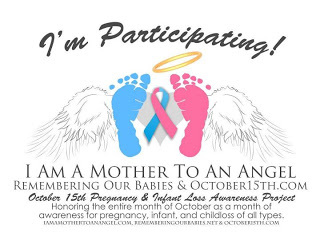 You can visit the official site of Pregnancy and Infant Loss Remembrance Day. We are honored to be part of first event to honor this day in the Madison area. The Forever in Our Hearts Remembrance Day was the inspiration of Alissa Paulson-Cedars in memory of her daughter Kennedy Kate that who died in October 2009. You can read more about how Alissa and I met and started working on this event here. The event will be held on Saturday, October 15th, at 9 am at McKee Farms Park in Fitchburg, Wisconsin. The event will start out with an inspirational speaker, Linda Colletti, followed by reading of the babies names, a memorial walk, and a dove release and bubbles to heaven. This event is for all families who have experienced the loss of their child(ren) through pregnancy, stillbirth, or in early infancy. We encourage the families and friends of those parents to join us as well. You can read more about the event on thewebsite and purchase tickets to attend here. If you are planning to attend the last day to purchase a ticket that includes a t-shirt will be October 7th. We are including the list of all babies whom we’ll be remembering this day on the t-shirt for those that register before October 5th, so if you’d like a t-shirt please go register now! We also have an option to include a memory butterfly for your child and a walk in spirit ticket option if you want to support the event but are unable to participate with us that day. Regardless of your participation in our event, I hope you take the time to get involved this month, see below for ideas! One out of every four women will experience the loss of a baby at some point in their lives. That’s right–25%! Pregnancy/infant loss is an issue that while very common, is rarely talked about. Because it’s become such a “hush-hush” and taboo topic, those who experience it are often left to grieve in silence, alone. It’s time for things to change. It’s time to open up the conversation, to get the dialogue started. It’s time for everyone to come together, raise our voices, and reach out to the others who are out there, thinking they are alone. Together we can break the silence and taboo surrounding pregnancy and infant loss. 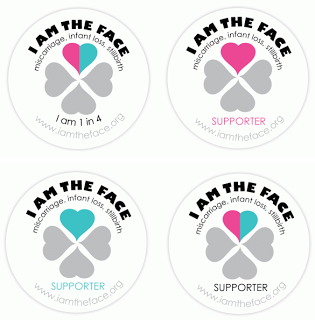 Help spread awareness by grabbing one of the official ‘I am the Face’ profile badges for your facebook, twitter, google+, blog, etc. Visithttp://www.iamtheface.org/ to grab your badge! Light a candle for your lost child(ren). Be sure to take a photo of it and send here. Do a balloon release with your family and/or friends. Give each person a note card to write a message to your child(ren), and attach to the balloons. Plant a tree in honor of your child(ren). Participate in a planned Oct. 15th event in your area. For events listed by location click here. ©2013 Mikayla’s Grace. All Rights Reserved.